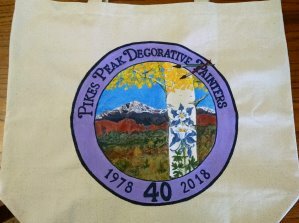 Welcome to the Pikes Peak Decorative Painters' Website! Tote bag designed by Cindy Bauer for our 40th Chapter Anniversary! Thank you for checking out our group. The Pikes Peak Decorative Painters is a fun loving group of people who enjoy each others company and have a mutual love of painting. We also have the desire to learn as much as we can about every aspect of our craft. I have been a member for over thirty years now. In that time, the faces have changed, but the people haven't. They are still caring, supportive and talented. Each person has a different take on decorative painting, it seems, but you put them all together and there is a wealth of information that cannot be beat. There are all levels of painters, from the very beginner to the advanced and they all love to share their knowledge. The group meets once month. Check the "Meetings and Events" tab to see where and when. There is a short business meeting to start and then a program. Sometimes we just paint together, and sometimes we have demos or someone will teach an actual technique or project. The programs last anywhere from 2 to 4 hours, as a rule. A few times a year, we also have day long (and sometimes two day) seminar by local and/or national instructors. 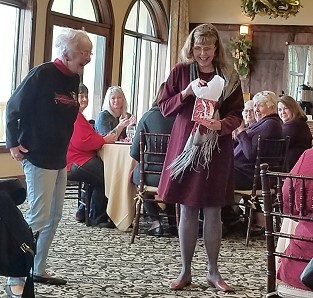 Besides the monthly meetings, we also enjoy annual events like a picnic in the summer, a fall weekend Retreat, and a holiday party in December. 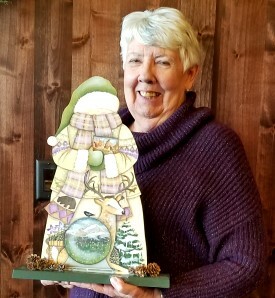 Some members also sell their painted items once a year at a local bazaar, and we all enjoy painting for local charities. You are welcome to join us as a guest at one of our meetings to see what we are all about in person. We'd love to meet you and have you join us in sharing our love of decorative painting! Our beautiful chapter logo was designed by Margaret Wehking. She was a cherished member and friend in our chapter until her death in 2003. She was a nationally and internationally recognized decorative artist, particularly in the aspect of stroke work, and designs with intricate color and detail. She was a published author and a highly sought after seminar teacher as well as a very gifted fine artist. Having lived in the Pike National Forest for many years, she implemented the best of scenic Colorado as our logo symbolizes the varied beauty of Colorado from the mountains to the beautiful Columbines, our state flower.